If you dream of owning your own business in the food industry, the first step is to look at local laws and regulations concerning food service. Food vendors need to be licensed within their state and follow some basic rules for food preparation and cleanliness. The type of regulations that you should follow may also vary depending on the type of food you are preparing for customers. 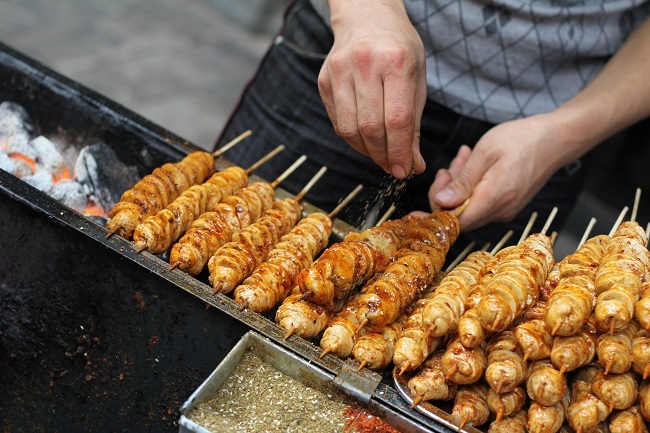 According to Food Safety for Mobile Food Vendors, there are some basic requirements for food handling that must be met before you can serve food to the public. Hot foods need to be kept at a temperature of at least 140 degrees Fahrenheit for safety reasons. Each hot food must be kept at 140 degrees and you must have thermometers on the dishes of held food to ensure the temperature remains constant. Cold food also needs to be stored properly to be safe for customers. A constant temperature of 40 degrees Fahrenheit or lower is the requirement for fresh produce, salads, and other cold foods served from a food vendor. You will also want to make sure that foods delivered to your place of business are the proper temperature before serving them. Hot foods should arrive at the correct temperature, for example, or they can’t be served to customers. If you are cooking food on-site, you will need to have the right equipment. All states have regulations that require meats to be cooked to a certain temperature before being served. Your cooking equipment will also need to meet local and federal food safety requirements to be served to the public. The simplest way to determine which laws apply to you is to check with your local Department of Health. Each city has a health department that covers basic food preparation laws that apply to the city or state. You must apply for a license or permit to sell foods to the public. After making sure that your food service equipment meets federal and state regulations, you will need to obtain your licenses and permits to operate in your city. Mobile food vendors will need a business license and an identification number from the IRS. You should apply for the tax identification number at least four weeks before opening your business. You may use either the name of the business on your application for a tax ID number or your legal name. A business license is obtained through your local licensing office. You need to use the same name on the license as you have used for your tax identification number application. A business permit may be issued after meeting the local and state requirements for food vendors. Mobile food vendors will need to pay licensing fees and take note of any zoning laws that restrict the locations where food can be sold. Some states also require additional paperwork be kept current and displayed at the location of the business. For example, you may need to have a food handling log and self checklist that is completed each day. Your business may be inspected at any time by a local health official. If you don’t have the proper paperwork completed, your business can be halted until you are in compliance with local, state, or federal laws for safe food handling. Overall, the process for starting your food vending business will probably take at least five weeks to complete. This article was contributed together with Robert Tritter, an aspiring lawyer who looks forward to practicing law and making the world a better place. He writes this on behalf of Berkel and their great Portion Scale, an extremely precise tool that saves you money in the long run by avoiding errors in serving portions. Check out their website to see what else they have for you and your business! Previous post: New Car Technology: Will Drunk Driving Become a Thing of the Past?